Laketown, at the Bukit Merah Interchange along the North-South Highway. All that you need for a refreshing stay can be found at the resort - the Bukit Merah Laketown Inn, Bukit Merah Laketown Marina Village, and Bukit Merah Laketown Waterpark. Surrounded by lush tropical greenery and natural lake, the resort makes a suitable getaway for the whole family. The Bukit Merah Laketown Marina Village is a tourist festival shopping village where you can find a wide variety of shops offering items such as crafts, swim wear and suntan lotions. Its restaurant Cafe Le Lac offers local and international cuisine's while its bakery offers a variety of pastries and cakes. Its four function rooms are available for seminars, exhibitions and events such as wedding dinners or annual get-togethers. For family entertainment, visitors can head towards kids amusement rides and also interactive fountain. 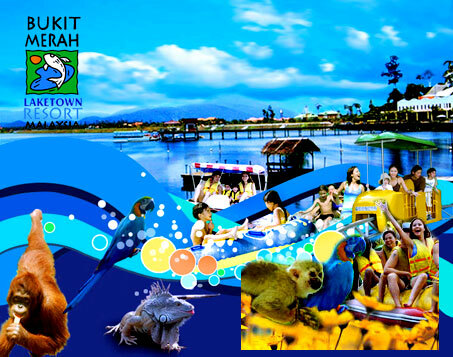 The Bukit Merah Laketown Waterpark comprises 8 water attractions, among them a Giant Wave Pool with simulated waves, Slow River Ride, and Raft Tube Slides. The Giant Wave Pool creates waves up to a metre high. For kids there is a Kiddie Bay. A 300m long Slow River cruise on floating tubes is available for adults as well as a specially-designed one for children. The Kid's Water Playground is a unique 'obstacle' playground with big buckets of pouring water and waterjet-guns to spray. The Giant Bubble, a first in Southeast Asia, is a Swedish-made inflated bubble for visitors to climb, bounce, slip and slide. Three Giant Water Flume Slides are provided where you can ride through a 'Midstation' pool or race down the 100m slide directly to the bottom pool. Facilities here include the Bubbles Restaurant, a fast food themed restaurant that serves western and local delights.
" Bukit Merah Laketown offers you all the right ingredients to make your stay pleasurable and fun. Visitors can experience the wonders of the lake cruise or enjoy the exciting activities at the Bukit Merah Laketown Waterpark." Bukit Merah Laketown offers you all the right ingredients to make your stay pleasurable and fun. Visitors can experience the wonders of the lake cruise or enjoy the exciting activities at the Bukit Merah Laketown Waterpark. Marina Village for shopping, restaurants, arcade games and the Resort Activity Counter where you can book for various activities including jungle trekking, local tours, bike riding and camping. Laketown Waterpark for all the wet thrills and spills you can handle. This is the largest waterpark in Northern Malaysia and has 8 major attractions including the very popular Wet Bubble, Wave Pool and Speed Slides. There is also a special themed kiddie's area; the Perak Mining Company. Eco-park "Say hello to nature". This park has living exhibits of exotic and local birds, otters, butterflies, reptiles and primates all in beautifully themed individual aviaries. There are also daily shows you should not miss, featuring some of the talented animals. The Jungle Boardwalk is a relaxing walk on an elevated timber walkway that takes you trough the untouched natural rainforest. Orang Utan Island is an amazing experience you should not miss during your stay. The island is the first natural reserve for these beautiful and rare animals in mainland Malaysia and guests are invited to observe them from our special viewing platform whilst they play and entertain with their delightful lifestyle - some rare photo opportunities are also offered as each day the animals visit the platform to meet you up close and personal! Chairlift. This is the one and only ride of it's kind in Malaysia and transports you high over the waterpark for some breathtaking views of the resort. Sky Cycle. Another way to explore the native rainforest, this time through pedal power! Another first for Malaysia, this attraction is an elevated monorail through the tree canopy that allows riders to have a bird's eye view of the surrounds and deer enclosure whilst pedaling your own special car. Lake Activities. Enjoy the beautiful Bukit Merah Lake by going on an exciting canoe ride, paddle boat trip or scheduled lake cruise - you may even like to catch your dinner at our fishing park that's brimming with local fish. Laketown Inn is completed with 174 Hotel rooms and can be booked at very reasonable rates. The facilities available include in-room fridge, amenities and movie channels. You can also visit beautiful and traditionally preserved local attractions on two arranged tours, Kampung Selamat and Kuala Sepet`ng. These tours will take you through authentic postcards of Malay life including visits to a rubber plantation, charcoal factory, fishing village and demonstrations of historic mat weaving, fishing and games. To get to Bukit Merah Lake Town, use the North-South Expressway until you reach the Bukit Merah Lake Town exit. The journey to the park itself is approximately 35 minutes from the Penang Bridge and an hour from the City of Ipoh. If the Federal Trunk Road is used, it takes approximately 75 minutes form the Penang Bridge and 45 minutes from Taiping.